This item is custom "Made to order" only. Royal Blue and White seed beads on silver safety pins. one pin with three sterling silver Greek letters or Initials beads . Colors may be customized for a nominal cost. Bangle height approx. 1 1/2 inch, stretchy band fits most wrist 7 - 7 1/2 . No worries, if your wrist is smaller or larger please make note of wrist size when ordering. 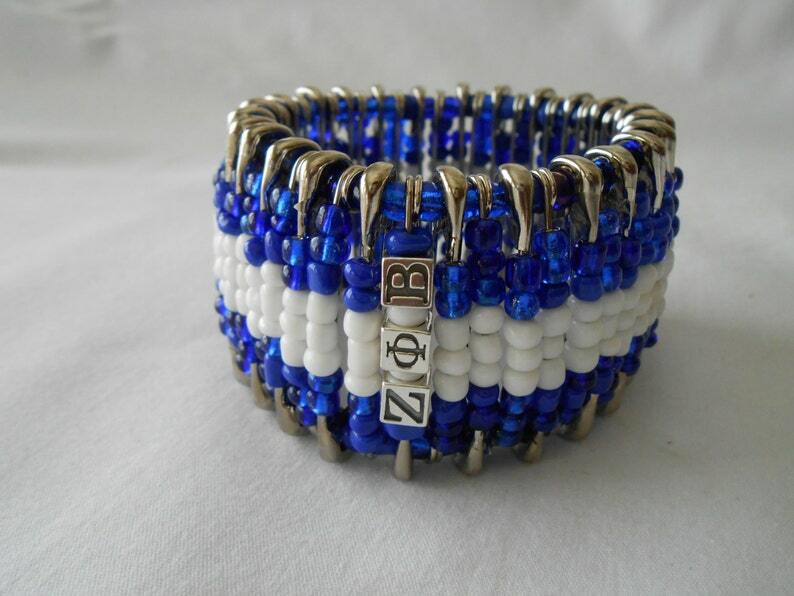 Custom order the sterling silver beads in Initials or Greek letters. Bead between the Lions Safety Pin Beaded Watches, Bracelets and Bangles may be handcrafted to personalize your desired colors. Please convo (contact) me before placing order to confirm colors and custom order pricing.